SPRUCE CREEK, FL - They started before dawn to take advantage of the cooler air. The caravan assembled at State Road 44 and County Road 4118 started unfolding large colorful shapes in the dark. Event organizer Mark Roberson sent two small weather balloons skyward to test wind direction. A black balloon fizzled and zigzagged to Earth, but a white one drifted mostly east, then slightly northeast. The test verdict: A good day for ballooning. Then the noisy propane tanks lit up and the floppy shapes became gorgeous balloons with the flames at the bottom contrasting the sunrise skies and lighting up the vibrant colors of their designs. The balloonists came from the local area and from places across Central Florida to hold the first Daytona Beach Hot Air balloon Festival. Soon the ground slipped away and the lucky ones drifted above the contour of the land, topping trees, skimming soggy sod fields, skirting roofs. They went high to catch a north gust to stay on course and landed at the Spruce Creek Fly-In, where a group of residents and friends congregated. The airport closed to airplanes for half an hour during what airport manager Sal DeVincenzo said was "exciting" and "not a run-of-the-mill day." 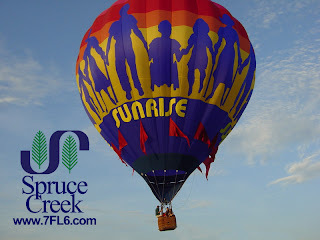 Follow the group of balloons as they fly to the Spruce Creek Fly-In in this first-ever celebration.